It’s POINTLESS to play anywhere else! The Farm Card sets the bar among golf courses in Portland, because no one else rewards you like we do. You earn a point for every dollar spent on green fees that you can redeem for FREE golf. Plus, with status upgrades you earn points faster. Up to 5 x’s faster! As a Farm Card member, we’ll give you 1 point for every $1 you spend on your green fees. It’s easy, just redeem when making your reservation online or ask us at check in for what you’ve earned. Once you achieve the totals below in the calendar year, regardless of redemptions, you’ll be upgraded. Merchandise in stock (personal use only) receive invoice cost +10% pricing! Special Orders (personal use only) receive invoice cost +10% pricing! GENERAL TERMS: Points are rewarded for Farm Cardmember green fees only; paying for a guest or another member does not earn the paying member points. Redemption discounts are not valid with other promotional discounts or coupons. 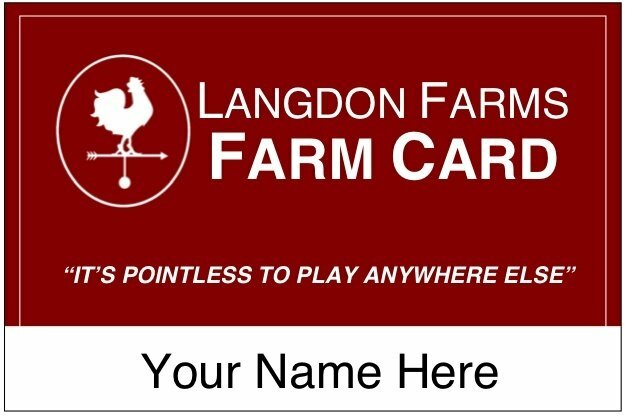 Cart fees, practice balls, purchases in the Golf Shop or Langdon’s Grill do not earn points. Program is subject to change. ROLLOVERS: Points are automatically rolled over from year to year as long as your membership is renewed before expiration. UPGRADE TERMS: Status upgrades are based on points accumulated during the calendar year (January thru December). Rewards increases are given to the green fees paid after the status level is achieved. Vouchers earned will be held in the Golf Shop and you will be notified by email. Status rewards expire at the end of each calendar year.